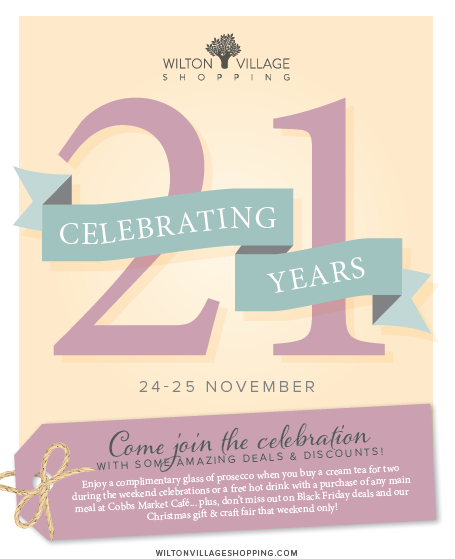 We are very excited to announce that 2018 sees the 21st anniversary of Wilton Shopping Village. Our beautiful, picturesque and tranquil shopping village started off as a humble, small town shopping centre; but now it has become an inviting and thriving part of the local community offering something for everyone. As our anniversary approaches and 2018 comes to an end, let’s take a moment to remember the heart warming events our shopping village has brought us this year. From the Royal Wedding and Wimbledon screenings all the way to Vintage Sunday, and let’s not forget the inaugural gin festival. Join us in celebrating our anniversary the weekend of Saturday 24th and Sunday 25th November with some great Black Friday deals and our beautiful Christmas Craft Fair.